The valley that lies behind Taggia climbs along the Argentina river and is named from it. It’s a narrow gorge and the height from sea level is quite noticeable. One of the most well-known town of this valley, Triora, it is about 800 meters above sea level. We started our trip from Triora on a beautiful day in April. Going up the road, winding but wide enough, in half an hour we reached the village of witches. On top of the Argentina Valley, Triora is famous for the witch trials that took place here between 1587 and 1589. Due to this fateful period the town is ow famous, and at the entrance f the old town now you can even find an ethnographic museum and witchcraft that is always open and the cost of the ticket (2 €) is really token. The walk in the old town is a real treat and a satisfaction at the sight; the core is well preserved and the characteristic portals, the covered alleys and the stone houses are a very well-kept. In the southern part of the village you can visit the Cabotina, namely the home of witches; the path to get there is scenic and on nice days you can enjoy a wonderful view both to the mountains and to the towns further down in the valley. In August, Triora is a must to visit, due to Strigora event. It’s a whole-day event dedicated to the witches, with theater and music and stalls selling traditional local products. After the visit to Triora, we drow for about 6 km down the valley and we stop in Molini di Triora. This other village of the Argentina Valley is famous for the bread, so much so that when we stopped to buy it we found a line of people waiting outside the bakery. This bread, recognized as a traditional food product, is made from a blend of flour, buckwheat flour and bran and has the particularity to stay good for a long time, even longer than a week. 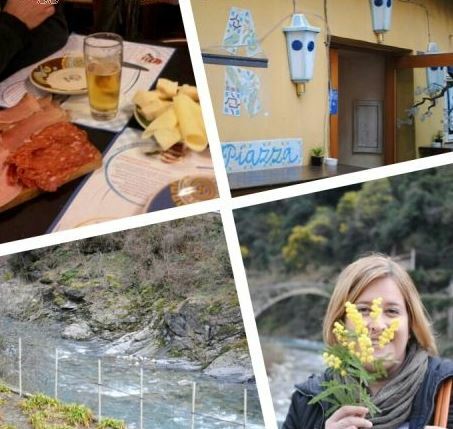 If you want to stop for a break, we suggest a couple of places; in Molini di Triora, in the main street, there is “Gallo Nero“: taste their cold cuts and cheese. Badalucco is another town of Argentina Valley, not far from Taggia and the sea. It is famous for its pottery and murals. Along the alleyways [the narrow streets of the historic center] the walls of many houses are painted or with painted tiles or carvings next to entry gates of the houses or beside the stairs steep and narrow that allow access to the upper floors. Even here it is pleasant to walk and explore in every corner and under every arch the more elaborate or simpler artworks… almost a treasure hunt. Thus, a day in the valley of the witches can turn into something magical!